Fuke Zen (Japanese: 普化禅) was a branch of Zen Buddhism which existed in Japan from the 13th century until the late 19th century. Fuke monks were noted for playing the shakuhachi flute as a form of meditation. Fuke Zen, according to its own accounts, is derived from the teachings of the Chinese Zen teacher Linji Yixuan (c. 800-866), known in Japan as Rinzai Gigen. Among Linji’s students was Pǔhuà (普化), whose name is read as Fuke in Japanese and whom the Fuke school counted as its founder. Puhua was reputedly a multi-talented monk, known for being inventive and at the same time quite strict. There is some controversy as to the degree and nature of musical talents, but his followers would often reflect on a certain story for inspiration: the story describes Puhua going through his hometown, ringing a bell to summon others to enlightenment. The same, for many Fuke practitioners, applied to the shakuhachi, and its mastery was seen as a path to enlightenment. Fuke Zen was brought to Japan by Shinchi Kakushin (心地覚心)(1207-1298), also known as Muhon Kakushin (無本覚心) and posthumously as Hotto Kokushi (法燈国師). Kakushin had travelled to China for six years and studied with the Chinese master Wumen (無門). Although it no longer exists as a religious organization, Fuke Zen’s following during the feudal period was quite extensive. Its members could be easily recognized by their practice playing the shakuhachi flute, which was considered a form of meditation and was called suizen (吹禅). These musician-monks were known at first as komosō (薦僧; literally «straw-mat monks») and, by the mid-1600s, as komusō (虚無僧; literally «emptiness monks»). Fuke Zen in general stressed pilgrimage, its adherents were mostly lay-practitioners rather than clergymen. During the Edo period (1603-1867), many ronin became incorporated into the sect, and due to the temperaments of these former samurai, the sect gained the reputation of harbouring troublemakers. Fuke, which had initially been a loose affiliation of monks and lay pilgrims, solidified as a sect around 1700. However, the sect died out in 1871 following the Meiji Restoration. The new government promulgated a grand council proclamation banning the practice of Fuke Zen and playing the shakuhachi for religious reasons. 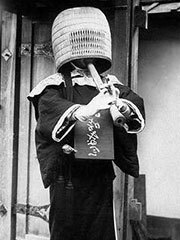 The shakuhachi itself thrived and prospered in secular circles, but its use as a religious instrument was uncommon until recently.